Jewelry by Rhonda - Wedding Jewelry, Bridesmaid's Jewelry, Cake Charms, Wedding Hair Jewelry, Wedding Cake Toppers, Wedding Bands, Jewelry for Weddings! This handcrafted sterling silver jewelry set is made with genuine cultured freshwater pearls - you have your choice of white/natural, pink/peach, or black/peacock pearls. The sterling silver necklace is approx. 16" long (yes, custom lengths available - Email me) with a 2" extender. The sterling silver bracelet is approx. 7" long (yes, custom lengths available - Email me) with a 1" extender. The sterling silver necklace has two 3-pearl stations and the bracelet has three 3-pearl stations of approx. 4-5mm round potato pearls. The focal point of the necklace is a feminine sterling silver filigree link that is approx. 1/2" x 5/8". The dangle is a matching station pearl and an approx. 7x9 teardrop-shaped pearl. The total length of the dangle is approx. 1". You can add 2" of length to the necklace when needed with the 2" sterling silver extender - it has an approx. 5x7mm tear-drop pearl at the end. The sterling silver bracelet features 3 matching 3-pearl stations of approx. 4-5mm round potato pearls. There is a 1" sterling silver extender and it also has an approx. 5x7mm tear-drop pearl at the end. The earrings are sterling silver Frenchwires that match the center drop of the necklace - they are approx. 1 1/4" long. Are you looking for a special pearl color? Do you have a question, request, etc? Email me. Here is a bride's order for her wedding party - she has 2 maid-of-honors, 4 bridesmaids, and 1 flowergirl. The Maid-of-Honor will wear a 3-piece necklace, bracelet and earrings jewelry set. Each Bridesmaid will wear a 2-piece necklace and earrings jewelry set. We even custom-made a matching necklace for her flowergirl. This bride had ordered Swarovski™ crystal pearl necklace and earring jewelry sets for her bridesmaids in Swarovski™ Light Crème Rosé. She loved the bridesmaid's jewelry so much, she contacted me again to make these custom pieces for her bridal jewelry in the same crystal pearl color (Light Crème Rosé). She liked this sterling silver filigree necklace and our drops of pearls necklace, so she asked me to combine the two necklaces. She wanted a classic pearl bracelet and longer earrings. She also wanted a something blue anklet. We made all of her jewelry pieces with Swarovski™ Light Crème Rosé crystal pearls to match her wedding gown color and her bridesmaid's jewelry sets. Click here to see pictures and read her comments. 3-piece necklace, bracelet and earrings jewelry set in Clear Swarovski™ crystals - she requested the teardrop-shaped crystals be used in her jewelry. Her jewelry is made with all crystals, no pearls, notice the teardrop crystal dangle on the necklace and earrings - we even put a teardrop crystal on the extender on the back of the necklace. The teardrop crystals were extended into the bracelet. She requested longer earrings with the same teardrop crystals. Special request bridesmaid jewelry - necklace with longer earrings - no problem! 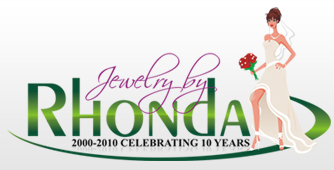 Do you have a special request for jewelry? Email me!